Final timetables are now out for Southeastern’s Greenwich line from January 12th 2015. During the evening peak period, from 1730 to 1830, there are reductions in total trains along the line heading from central London from nine to six. Due to this, total passenger capacity throughout this time of the evening peak drops from 9521 people to 7680. It’s a 20% cut in capacity and almost 50% less seats. This is on services leaving London terminals and running along the line to Dartford via Greenwich, and that cut is if every remaining train then runs at the maximum length the line can take. The best case scenario. This gives a current total current passenger capacity of 9521. From January three trains are cut during this time – all are 10 car trains with the highest capacity for passengers. These are the 5:37pm, 5:58pm and 6:21pm trains from London Bridge. 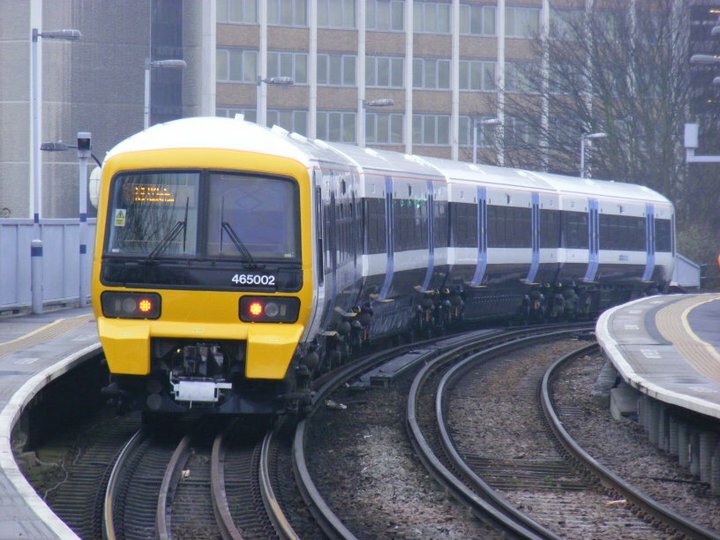 If all remaining six trains running are stock with the largest possible capacity as southeastern promise, which is 10 carriage class 376 units, this gives a post-January capacity of 7680 (1280 x 6) – down from 9521. The reduction in numbers of seat are very large too – 5092 reducing to 2688 – a near 50% cut. I’ve assumed the six remaining trains will be 10 car 376 as all trains will stop at Woolwich Dockyard, and as noted on this site before, the platforms there are shorter than the rest of the line which prevents 12 carriage trains stopping there. Unless Network Rail & Southeastern have found some workaround then there will be no 12 car trains at this very busy time. But lets say some workaround is found, which I’ve seen no evidence of, then there would be six trains, which would be 12 carriage Class 465/466. Each would have a capacity of 1392 (1044 seats and 348 standing) giving a total capacity of 8392 passengers. It’s still a reduction from 9521 people carried as of now, though far better that what passengers are faced with if only 10 car trains run, and the 12 cars would have many more seats. With all the years to prepare for these changes this should have been the goal. With altered interiors capacity could have been maintained. Over the past four years the class 465 trains have been regularly going up north to Doncaster. This has been for light internal work (a really cheap blink-and-you’ll-miss-it job by southeastern) along with external painting into corporate southeastern colours, plus some mechanical work. There was a real missed opportunity on carrying out more radical internal work to alter layouts, which would have increased capacity. Removing rows of three very cramped seats (with the middle often unoccupied) to be replaced with 2 seats and a wider aisle would have increased capacity, so the impact of cuts this January would be lessened. Such a refurbishment could also have provided air conditioning (introduced on class 465’s sister trains with other rail companies) and wifi as introduced recently on South West Trains and c2c, to name just two other companies. None of this was done. Now all class 465 and 466 trains are again to be sent off for disabled toilets to be introduced over the next 4 years. Why was this not combined with previous work the past four years? Those in charge of strategic planning at Southeastern, Network Rail and the Department for Transport have not been on the ball. It appears the hope is that some of the 2000 fewer people able to use Southeastern via Greenwich will travel to Lewisham and then take a DLR to either Deptford Bridge or Greenwich where they can walk home. This will put strain on Lewisham trains, and this isn’t too useful for many, particularly those living in Maze Hill and Westcombe Park who will need to pay extra for a bus if this option chosen. The alternative for those further living down the line is to change from Cannon Street trains to Bank DLR services to Woolwich Arsenal. At an extra £800 a year numbers able or willing to do so may be limited plus the line is extremely busy. As often noted, these cuts also coincide with very large population growth and large scale developments all along the line. Anyone travelling cannot fail to see this the entire length of the line. As my last post showed, Cross Quarter beside Abbey Wood station is shooting up and the towers at Woolwich Arsenal are almost ready for occupation, ‘The Movement’ by Greenwich station is seeing people begin to move in and ‘the ‘Deptford Project’ directly next to Deptford station is also rising quickly and now visible from passing trains. And that’s just a fraction of developments. One interesting tidbit from recent parliamentary discussion on transport was the Mayor of London’s Deputy Mayor for transport, Isobel Dedring, criticising Network Rail for not taking into account developments and growth around stations and lines when it comes to forward planning. The Greenwich line seems a prime example. I’m all for the London Bridge rebuilding project. Huge benefits will be accrued. However the planning for it and its effects on the Greenwich line leaves a lot to be desired. The issues could easily have been avoided by enabling 12 car trains to run, and altering the internal layout of those trains. This would have allowed the service cuts to happen, which they must, but maintained existing capacity. There were years to do it. It hasn’t happened. To add insult to injury, no-one from Southeastern turned up to the advertised “Meet the Manager” session at Plumstead this evening. Really unacceptable. Looks like se managers at Cannon St backtracking on 12 car in Jan though even if they get them on other lines no good for Greenwich. All the relevant parties have had years to prepare for this deadline which was known YEARS in advance. No excuse. I do have the nagging feeling all parties just weren’t paying attention to the details of this line. SE metro can seem like the forgotton relative at the best of times. If no one paid attention for years problems only realised last minute? Maybe this is all a bit over the top though. What makes you think the remaining trains will all be 10 coaches? Have Southeastern said this? “Now all class 465 and 466 trains are again to be sent off for disabled toilets to be introduced over the next 4 years. Why was this not combined with previous work the past four years? Those in charge of strategic planning at southeastern, Network Rail and the Department for Transport has not been on the ball.” – I suspect is has something to do with the franchise being extended to 2018, so this must be part of the amendment to the contract. They’ve said they’d be at maximum possible length which is 10 car, and I can see big issues even with all remaining at that length given that still leaves 20% less capacity. If they’re not it’d be a complete mess. Having said that, it would be no surprise to see 5 or 8 popping up due to train faults. If one is cancelled the next will be a total scrum. The toilets are part of the extended contract but there was nothing to stop it being pushed in 2010/11 if a little forward planning had occurred. Other franchises have seen alterations to franchise agreements part way through.